Stainless steel is the material of choice in various industries where corrosion resistance is of utmost importance, take for instance parts that are exposed to harsh environments. However, this highly favourable property does not always go hand in hand with high surface hardness, wear resistance and fatigue strength. Most heat treatment methods cannot be easily applied to stainless steels to improve its properties. In particular, surface hardening of stainless steel by nitriding and nitrocarburising in the conventional temperature range of 500 to 1000 °C is highly detrimental to its corrosion properties. A possible solution is implementing processes that enable lower-temperature surface hardening of stainless steel. The EU-funded project PLASSTEEL has developed an advanced process for low-temperature surface hardening of stainless steel that allows accurate tailoring of the material properties. The new heat treatment process can be applied to all ferritic, martensitic, austenitic and duplex grades, imparting the material with unparalleled levels of wear, fatigue and corrosion resistance. Based on more than 40 years of experience, IONITECH LTD has developed a plasma nitriding/nitrocarburising furnace achieving excellent temperature uniformity on the whole working area. 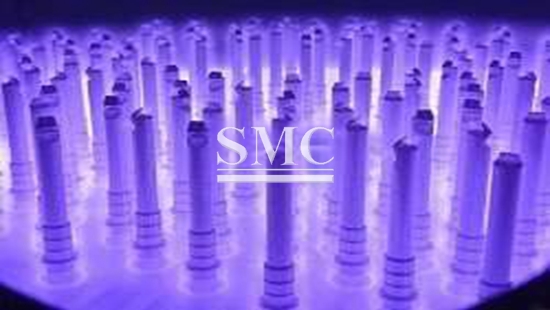 "The novel plasma nitriding furnace also eliminates the possibility for the 'hollow-cathode' effect. This local overheating might lead to temperatures above those needed for the PLASSTEEL process that will in turn lead to chromium carbide and chromium nitride precipitations on the grain boundaries of the steel. These areas will have higher surface hardness but will also be susceptible to intergranular corrosion," says leading research and development specialist Alexander Varhoshkov. The PLASSTEEL process is based on plasma technology and composed of a solution nitriding and nitrocarburisation process at temperatures below 500°C that enriches the surface layer of a workpiece with nitrogen and carbon. The carbon-containing gas added in nitrocarburisation can be methane, propane or natural gas. Its content varies from 2 to 10 % in the gas mixture. The treatment step can last from several minutes up to 20 hours, depending on the workpiece material and the requirements regarding the layer depth. Throughout the project, several types of stainless steels were processed and tested. Depending on the percentage of the alloying elements in these steels as well as other properties, results slightly varied. "Some of the alloying elements made diffusion of the carbon atoms harder and slower, thus leading to small differences in the diffusion layer and surface hardness. Nevertheless, in any case, the goal was to improve the wear properties of all types of stainless steel, while also retaining their corrosion properties," says Dr. Varhoshkov. Most surface-hardening techniques diminish the original corrosion resistance of stainless steels. IONITECH's advanced new process and plasma nitriding furnace show that this is no longer the norm. "This shortcoming is successfully circumvented by this excellent plasma nitriding furnace that provides precise control over the material properties," continues Dr. Varhoshkov. Working at low temperatures provided a remedy for dissolving nitrogen or carbon into stainless steel without the formation of chromium nitrides or carbides. Project partners succeeded not only in increasing the surface hardness of the parts by 4 times, but also in improving adhesive and abrasive wear, and the tribological properties of the metal as well.